Dirigo, Poland plan to continue playing 11-man football. At least two schools identified as potentially switching from 11-man to eight-man football under the Maine Principals’ Association’s proposed realignment are planning to stick with 11-man football for the 2019 season. Athletic directors and coaches this week also expressed concern about the proposal’s reduction from five classes to three for 11-man football. The MPA’s football committee surveyed schools across the state after its November meeting in hopes of gauging interest in eight-man football. Athletic directors said the survey asked whether schools would prefer eight-man or 11-man football, and also asked separately if they would consider eight-man football. Athletic directors from Dirigo and Poland high schools confirmed they indicated on the survey that they would consider eight-man football, but said this week they are not committed to the proposal that lists them among the schools that would make the switch. “We want to play 11-man football,” Poland athletic director Don King said. King said the Knights finished last season with 28 players dressed and should have plenty to continue playing 11-man next season. Telstar was also listed as an eight-man football candidate, and athletic director Gail Wight said her school would like to be part of an eight-man league if the MPA adopts it. On Tuesday, the MPA football committee said 20 schools indicated at least some interest in eight-man football in the survey. It discussed a proposal that would place those schools in one of two eight-man football divisions, which would be based on enrollments over and under 350 students. Gray-New Gloucester is another school listed among those that would consider eight-man football. School administrators and coaches could not be reached for comment about the MPA’s proposal. The schools keeping 11-man football would be divided into three classes based on enrollment. The state currently has five classes for football. 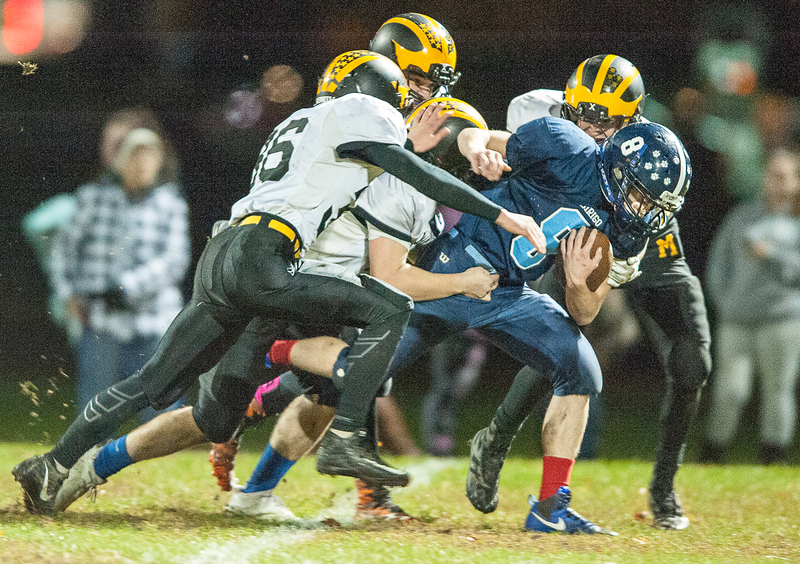 Fifty-nine schools would be divided into three classes for 11-man football in the proposal. It would put schools of 760 and over enrollment into Class A, 505-759 into Class B and 504 and fewer into Class C.
The MPA is giving schools until Jan. 25 to let it know whether they intend to play 11- or eight-man football next fall. The football committee will meet again on Jan. 31 to finalize a proposal that would be voted on by the full MPA membership in April. Some expressed concern about what realignment would mean for competitive balance and scheduling and want the final proposal to expand the number of 11-man classes. “With the number of teams sticking with 11-man, I would hope they would consider four classes,” King said. Leavitt, which has bounced back and forth between Class B and Class C in recent years, would move from C back to B under the new format. Coach Mike Hathaway said he’s fine with that change but worries the proposal may have a negative impact on competitive balance, which the MPA’s shifts from three to four and now five classes in recent years were meant to address. Hathaway pointed to 2018 Class C East champion Nokomis, which struggled to gain a foothold for its relatively new program in Class B before moving down a classification, as an example of a program that got a much-needed boost from the five-class alignment.